Wn13 Pont sur le Canal, K.V.U.Gr Riva-Bella, K.V.Gr Caen. Wn13 Pont sur le Canal. The 6th June 2010 memorial service. All they are is a bridge over a canal and a bridge over a river with code names Ham & Jam. But strategically these two bridges would have been the only way an army could attack over to hit D-Days eastern flank or capture them and hold them and the Allies have the advantage of being able to move east out of their small area of operations. The canal today with the Gondree Café. Wn13 Pont sur le Canal. The original Bridge. 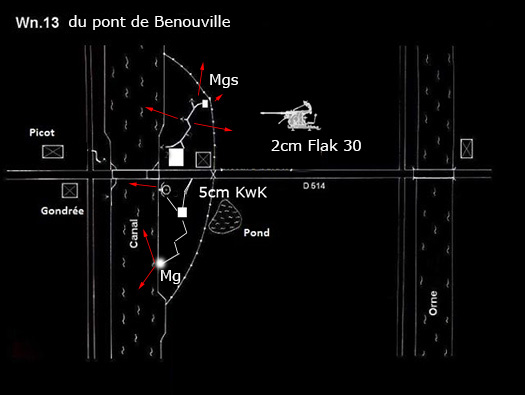 Three gliders in the early hours of D-day landed close to the Pont sur le Canal and overwhelmed the small garrison of infantry. 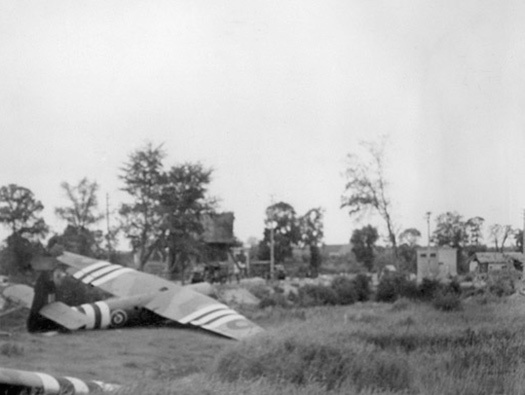 The bridge over the River Orne was taken by two gliders but was found not to be defended. 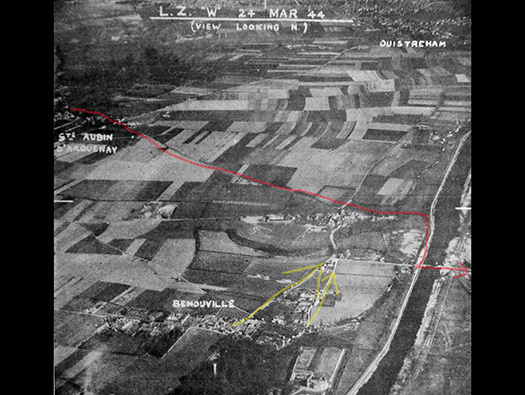 Next paratroops of the sixth Airborne landed to the east of the canal/river around the Ranville area to cut of any advances made on the bridges. At 6.30am the Americans started landing on Utah Beach and then Omaha, with the British at Gold, Canadians at Juno and more British at Sword Beach. Commandos under the Lord Lovet and his famous piper landed after the initial assault and moved off south skirting any opposition to be left to follow up troops. They arrived at the bridge slightly late and passed over to hold the far side. Airborne troops then started to move out from their assembly areas and gradually took over from the Ox & Bucks and relived them. It had been a long long day. Bill Millin playing to troops. The Commandos under Lord Lovat fought there way from the beach to St Aubin and then on to the bridge. Red Arrow. 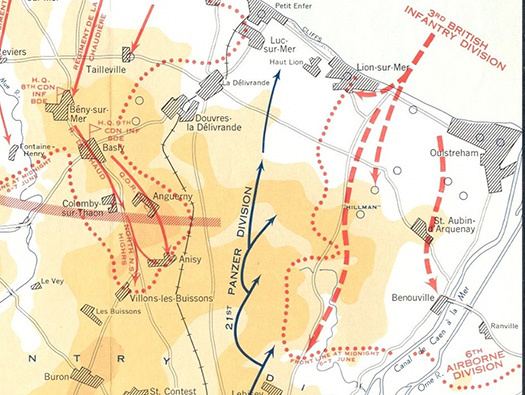 The Germans attacked from Caen through the village of Benouville. Yellow Arrows. Commandos meet Airbourne in Benouville. The Germans made great use of French captured tanks, these started to attack the Airborne troops in the early hours of 6th June.. The original Bridge now in the grounds of a very good museum. 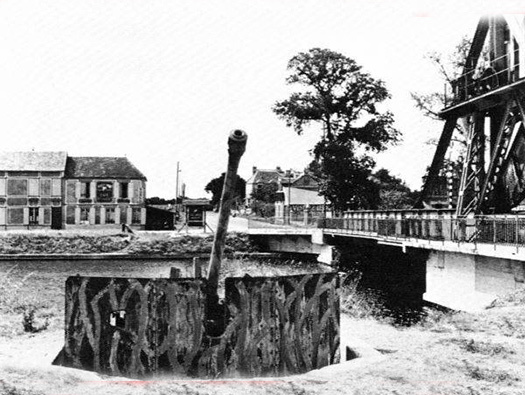 A Bascule (Rocker) bridge built in 1935 across the Caen Canal 3.5miles inland from the sea. By 1944 it became a very important river crossing for D-day to secure the eastern flank of the landings. 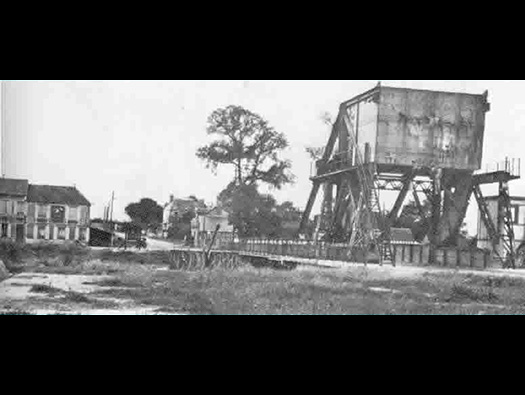 A parachute and glider force was due to land to the east of the river around the village of Ranville, but the bridge needed taking and holding before the airborne and seaborne forces landed . 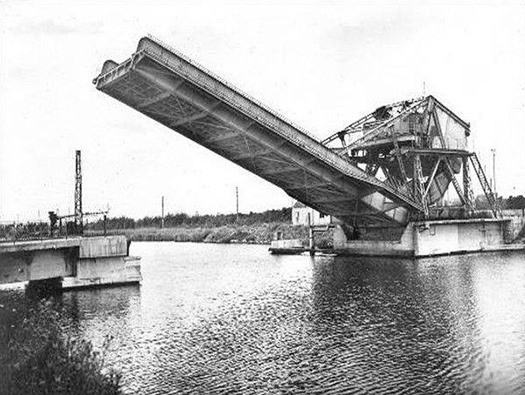 Flak ship/boats would pass up and down the canal and one was used to attack the bridge after its capture and was damaged. The deck plate where the actioned happened. Maj. Howard and his Ox & Bucks took landed on the far side, took the bridge and advanced across the bridge to secure both banks. Shrapnel and bullet holes are all over the bridge. The first British soldier killed on D-day was Den Brotheridge and he was buried in the grave yard at Ranville church. Ranville Church yard his stone. Wn13 Pont sur le Canal. The new bridge. The new bridge, slightly bigger than the old one but almost looks the same. The new control tower next to it and the post war French war memorial moved to its new place by the bridge. The new bridge looking very good in the autumn sun. 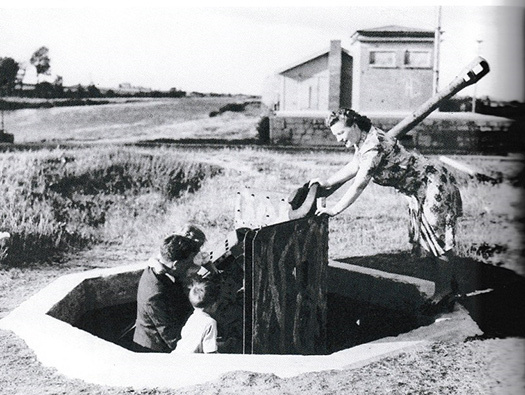 Bf65a emplacement for a 5cm KwK with an ammunition room. Wn13 Pont sur le Canal. 6th June 2010 memorial service. On the 6th June 2010 we just happened to be around for the memorial weekend. Maj. Howards daughter who has attended many of the 6th of June memorial days. Maj. Howard in the centre of some of his troops. 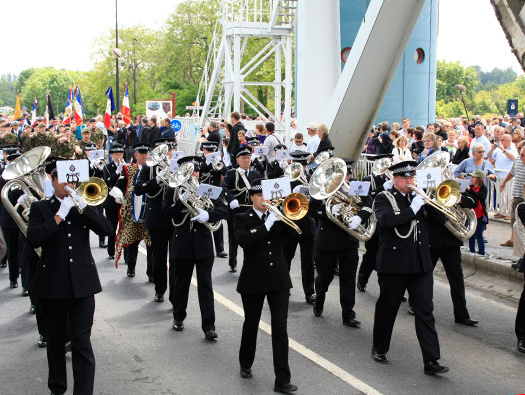 The West Yorkshire Police band playing Nimrod. West Yorkshire Police band leading the march past. The few, rear right Albert Smith, Brian Pridey at the front and Pat Turner?? in the light suite. 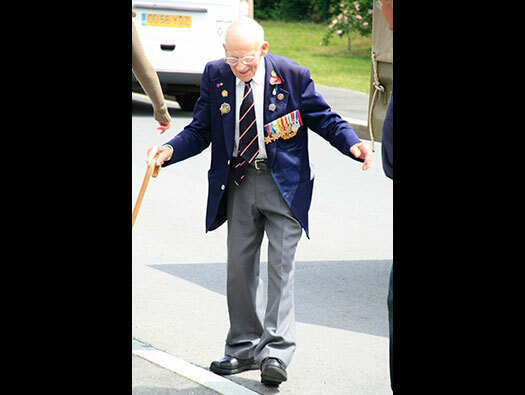 Fred Walker Roy Cadman two lovely old men that tell the most wonderful tails of D-Day and Pegasus Bridge. Wn13 Pont sur le Canal. The German defence. The 5cm KwK L/60 showing the original camouflage paint. Crew on an L/42 model. The emplacement when the gun has been removed. The layout of the defence. The target. The troops here at the time of the landing seemed not to have been properly alerted to the fact something was going on. That shows that the pre bombing of the beach areas had dulled the defenders into the belief that it was just another day in Normandy. 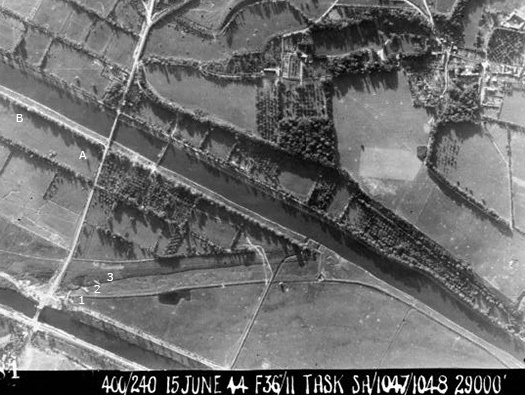 Reconnaissance photo showing the bridge and two houses on the far side. 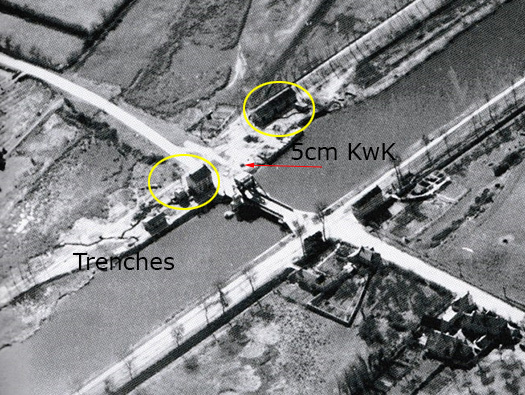 They were removed to allow the 5cm KwK a better view covering south and north. With the start of 1944 and Rommel taking over as inspector of defences on the Atlantikwall, things started to move. Here the 5cm gun could not fire in a 360° as there were houses in the way. So these were pulled down. A small pill box defence replaced one of the houses. Trenches extended. Training for operation Dead Stick started by the OX & Bucks attacking the bridge at Exeter, England. The bridges here look very like the ones at Benoville for training purposes. The bridge supervise at Exeter was not at all happy at first about having a load of squadies running around and firing blanks and flairs. But he came around later to assist them in any way he could. It was good practice. The above Google image may not look like much but zoom in below where it says Martin Down NNR and you will see a long mound. This is the BUTTS and moving to your left you will see square blocks. These are where soldiers would lay out in lines shooting at targets on the Butts. This is where the Ox and Bucks came for their last exorcise to hone their shooting skills and adjust their gun sites. This range is a very big one but there was no camp with huts so the men would have had to live out in small two man tents. Hardening up for a campaign in Normandy. RAF Tarrant Rushton was a nearly brand new aerodrome on a plateau to the the east of Blandford Forum. It is still there with its last two T2 hangars and a perimeter track and three runway layout. This picture was taken on the 22 April 1944 as training was going on. There were squadrons of Halifax bombers converted to tow gliders and also drop agents and arms to the European underground. It would have been buzzing with RAF types and a mix of airborne and agents. Quite an eclectic mix. T2 hangar at RAF Tarrant Rushton. 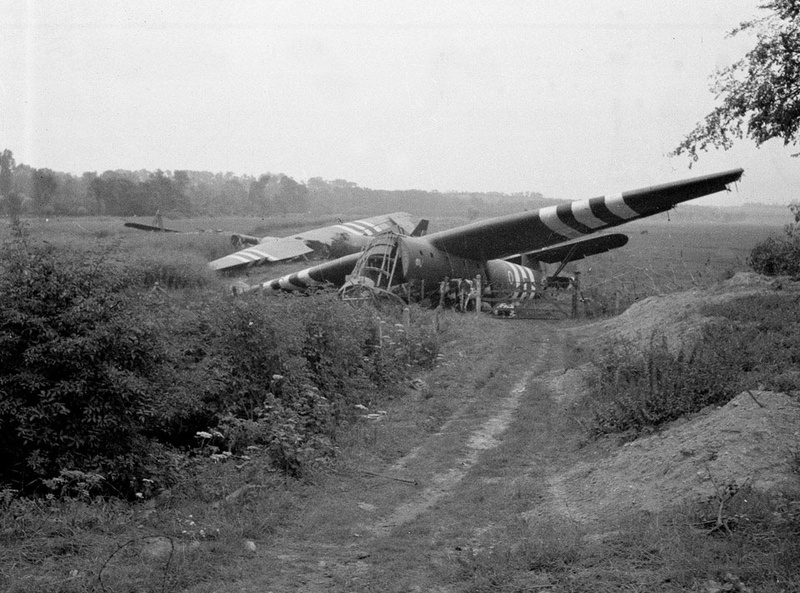 South of RAF Netheravon in Wiltshire is a small wood and the six gliders and crews practiced their landings here day and then night for operation ‘Dead Stick’. 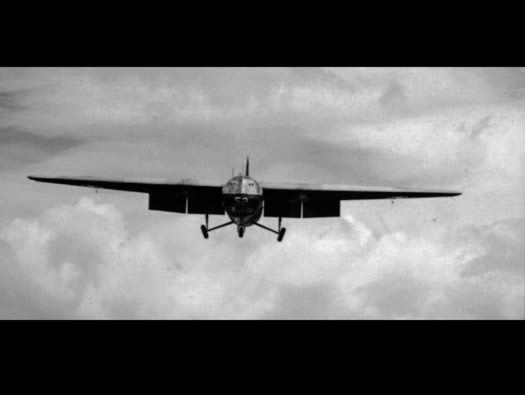 The gliders could be towed by tractors up onto the airfield and the Halifax pilots take them back to RAF Tarrant Rushton. Operations board at RAF Netheravon. 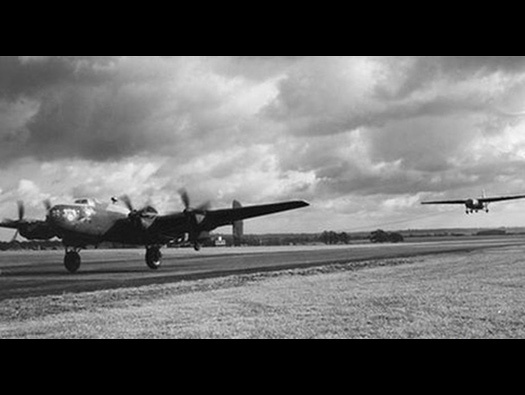 A Halifax bomber and a Horsa glider taking off at RAF Tarrant Rushton. My father in law remembers these heavy bombers taking off and flying around towing gliders and then a few hours later returning and landing. But on D-Day morning, he said the air started to fill with the roar of aircraft engines and it went on for several hours. Then very quiet. They had all left. Later in dribs and drabs, planes started to return and after some piece and quite it all started again as the next operation took off. The re supply of Airborne forces in the late evening of June 6th. 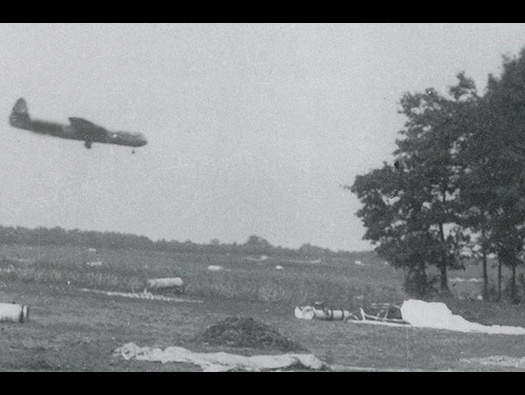 A Horsa Glider coming into land with its barn door flaps down. 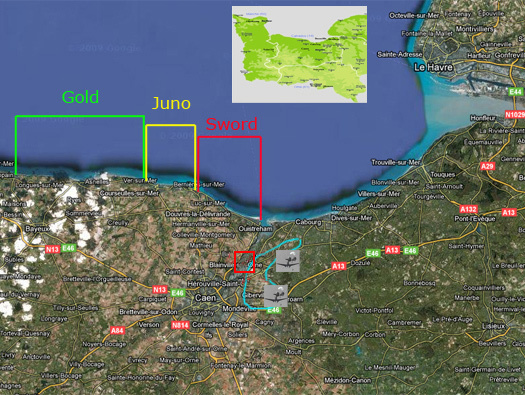 The three glides that landed early on June 6th very close to their target. The pilot of Major HowardsÂ glider was Jim Wallwork and his co-pilot John Ainsworth. 1,2 & 3 the three gliders at Pegasus bridge and A & B the two gliders for the river bridge. The third glider landed some way away. During the battle a sniper firing from the building across the river was causing casualties. So two of the Ox & Bucks decided to fire the 5cm KwK at the building. They let loose a few rounds but Maj. Howard told them to stop. It turned out it was a maternity hospital.. 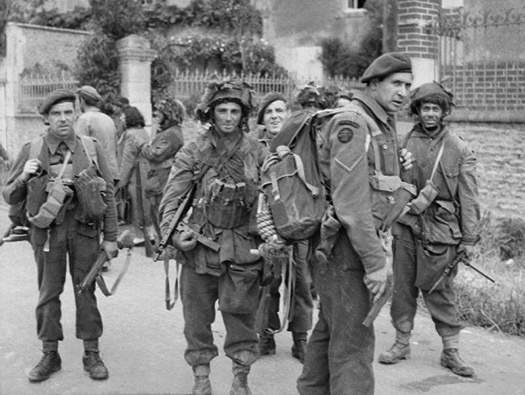 In Bénouville, junction of the commandos with the paratroopers of the 6th Airborne, here the commandos wear the beret and paras the helmet. 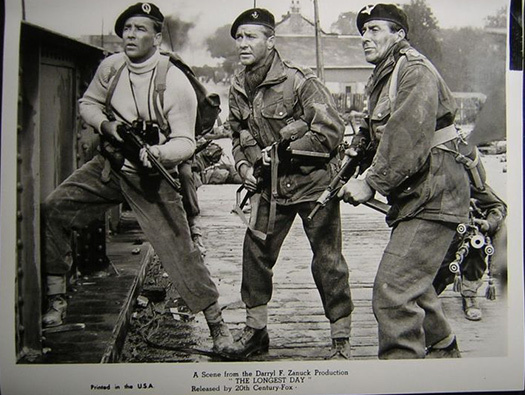 From the film ‘The Longest Day’ a very good scene showing Lord Lovet of the Commandos and Major Howard meeting on the bridge. On capturing the bridges the success signalÂ ‘HAM & JAM’ was sent out by their radio operator, the codes for the bridges. 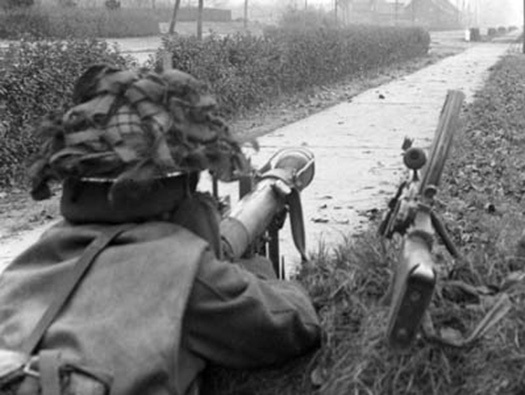 A PIAT anti-tank weapon like this one was used on vehicles and tanks attacking Benouville from the south. I believe it was a tank like this a Samou S35 tank that may have been hit by a PIAT antitank weapon. Another view of the three gliders and looking to the right is the building with bricked u windows to make it a small pill box defence. Wn13 Pont sur le Canal. The wars end. A picture of Maj. Howard, his wife, young daughter and young son visiting the bridge. Note the buildings behind that were fortified just prior to D-Day. Georges Gondree, Maj. Howard DSO & Capt. Wood in 1945 visit and reunion. Madam Gondree who I had the pleasure of meeting when I was probably 11 in 1962 with my parents. A memorable moment. This lovely old man full of medals, what did he do? ?